This is one of those posts that we love to write and it really puts meaning behind all the miles and points we collect. We are excited to share with you details of a loyalty rewards charity that is also based in our home town of Calgary. We're sure some of you have heard of them but for those of you who have not we'd like to introduce you to Give A Mile. Established in Calgary, Canada in February 2013, Give A Mile is dedicated to bringing together the terminally ill, or critically sick, with family members or close friends by crowdfunding airline flights through micro-donations of travel loyalty points. We work across Canada. 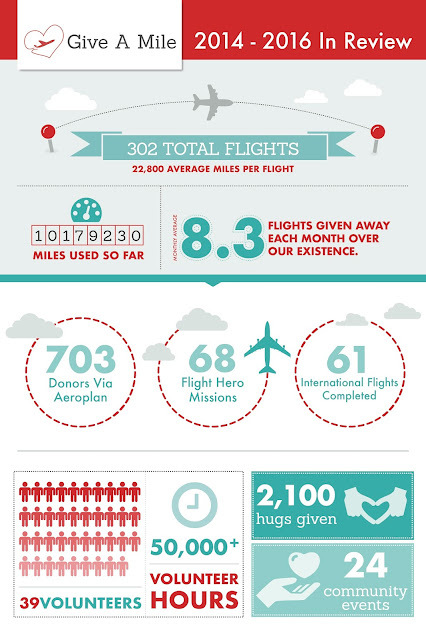 We are 100% donation model so all miles donated go to flights. We are 100% volunteer team with a Big Hairy Audacious Goal of giving 1 billion miles to families that need these flights. A federally registered not-for-profit agency in Canada, Give A Mile is recognized as a charity by Aeroplan’s Beyond Miles program, and offers tax receipts for money donations to donors through an agreement with the Place2Give Foundation. 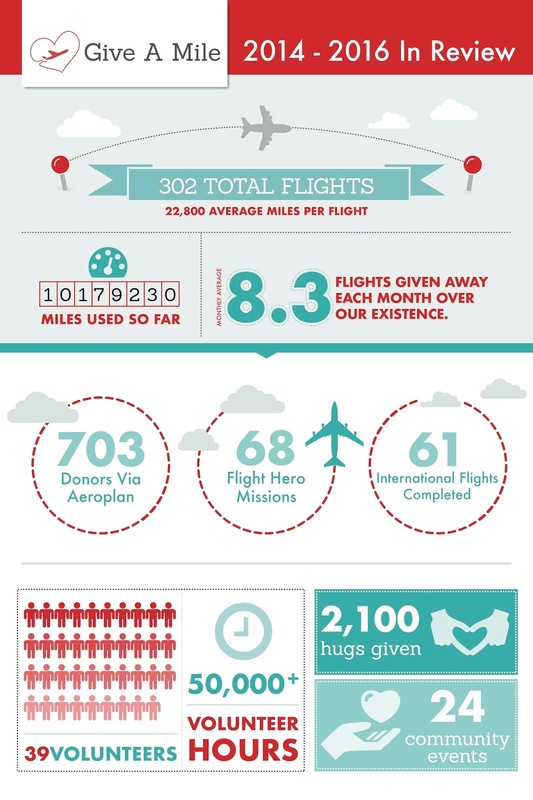 Check this out, in the four years that Give A Mile has been in operation they have now provided 330 flights courtesy of over 11 million miles that have been donated by people like you! Give A Mile primarily works with Aeroplan but also has partnerships with American Express, Marriott Rewards and Starwood Preferred Guest. That looks familiar! All amazing programs that come highly recommended right here on Rewards Canada. You can also choose to donate cash which helps cover taxes and fees on the award tickets provided to those in need. My name is Edith and I am a palliative home care client. I was diagnosed with advanced Stage 4 Pancreatic and Breast Cancer. I have “very little time left.” I am a mother of 7 children (ages 14-24) and I have been in Canada for many years. My children and I are Canadian citizens but my husband lives in Nigeria. My husband would love to come to Canada right now but due to finances we are unable to have him come. There is so much we need to take care of as a couple before my time is up. I really want to see us altogether to be able to say the things I need to. Please consider my application for my husband, he already has his travel visa and can come anytime. Be sure to check out giveamile.org today.